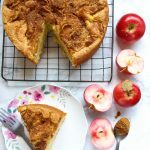 This simple vanilla apple cake is one of my favourite Autumn bakes – delicious with a cup of tea or serve with lashings of vanilla custard for a cosy pudding! I’m all about baking with apples and pumpkin right now. There’s just something about those cosy Autumn flavours that make me feel happy. For instance, these salted caramel apple and cinnamon scones are perfect for this time of year, as are these pumpkin cranberry maple glazed muffins. I came across this apple cake recipe a good few years ago Good Food magazine. It looked so inviting in the picture – a deep, fluffy looking sponge, topped with sliced apples and a sprinkling of crunchy demerara sugar. The picture just screamed “bake me now” so that’s exactly what I did. My cake definitely didn’t look as pretty as the one in the magazine, but once I tasted it I really didn’t care. Buttery and light with a deep vanilla flavour, the cinnamon sugar topped apples which had softened in the heat of the oven….I was sold. I’ve slightly adapted the recipe over the years, but only by a tiny fraction….this cake is just perfect exactly as it is. 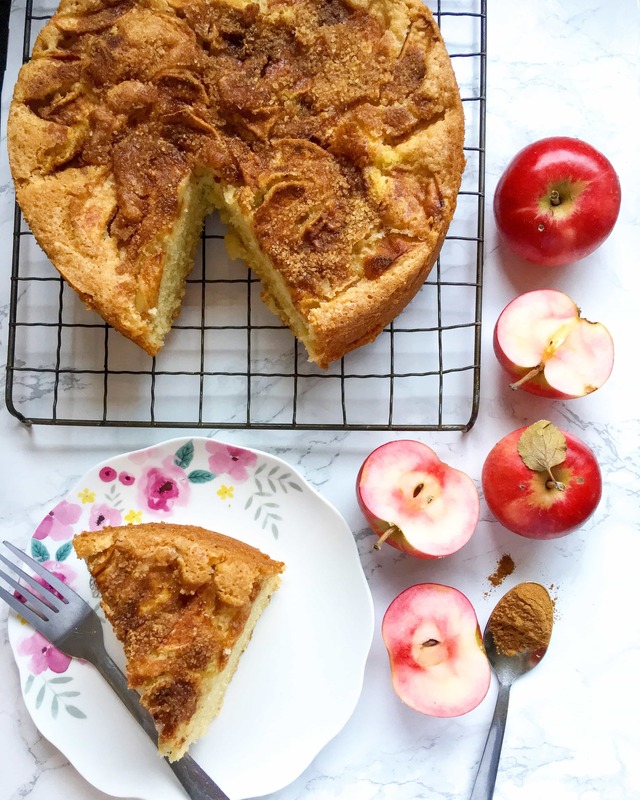 A simple but delicious vanilla cake with juicy apple slices and a crunchy cinnamon sugar topping. Using real butter and good quality vanilla extract will give you the best flavour. In a large bowl, cream the butter and sugar together until very light and fluffy. Gradually add the beaten eggs, beating well after each addition. Beat in the Vanilla. Sieve the flour over the creamed mixture and using a metal spoon, fold the flour in, taking care not to over mix. When the mixture is smooth, pour into the lined cake tin and level the top. Place your apple wedges on top, making a pattern if you like. In a small bowl, mix together the demerara sugar and ground cinnamon. Sprinkle the cinnamon sugar over the apples. Place in the oven and bake for 40-50 minutes, or until a skewer inserted in the middle of the cake comes out clean. I've used a variety of different apples for this recipe and Pink Lady, Bramleys, Gala and Cox's all work beautifully. I love cakes that easily double as pudding. This looks like delicious simplicity itself! Thank you Kellie! This cake makes such a lovely pudding ? Really love the flavours you’ve used in your cake, so deliciously autumnal. 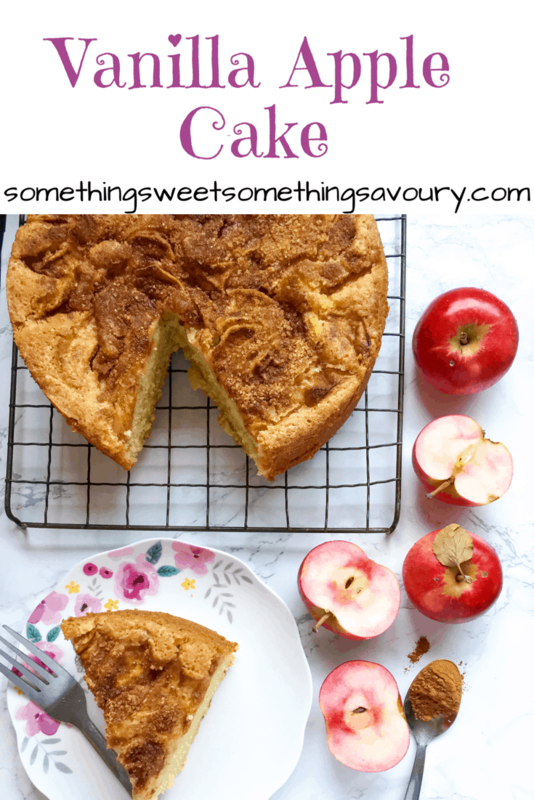 This looks delicious – I love baking with apples so much. Thank you ? Me too, apples are so lovely to bake with. So many options! If I could eat one cake for the rest of my days I would have a very hard time deciding between apple and chocolate! This looks SOOOO good! I’m the same…I wouldn’t know what to choose! It would depend on my mood at the time.